Cold. Calculating. Ambitious. Dishonest. Self-serving. Hawkish. If a situation has no way to serve her purposes, she turns her back and walks away. She doesn’t love America or its people. She doesn’t care about their struggles. She cares about Hillary Clinton. The presidential candidate is known for putting herself above everyone and everything else, and people hate her for it. But is it actually actually true? Her friends and family and campaign continue to show instances of Hillary caring for others on a personal level, but those can’t be trusted. She could be doing it for the positive press. After all, every caring gesture she makes is covered relentlessly, so clearly she has ulterior motives. Hillary Clinton does only exactly what she must do to look good to the public. Meet Janelle Turner, a mother in Winter Park, Iowa, who was diagnosed with breast cancer in May of 2015. You probably haven’t heard of her before. She is a private person, not given to much political speak, and certainly without time or money to campaign for or support any political causes. She’s just an average citizen, facing crippling medical costs while fighting the sickness that comes with her treatment, and trying to be there for her nine-year-old daughter, Nora. Every day, she battles fear on top of the aggressive cancer. You may not know Janelle Turner. But Hillary Clinton does. 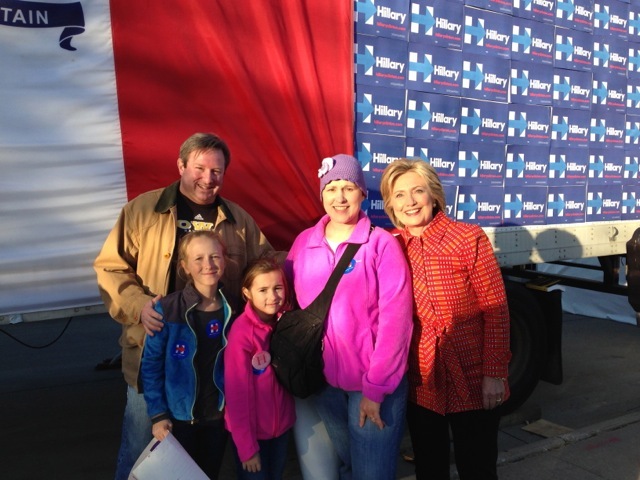 Back in October of last year, Turner decided to take Nora to a rally for Hillary Clinton. The girl was excited, and hand-made a sign for her mom that said, “Thirteenth chemo yesterday, three more, hear me roar!” The family had to bring lawn chairs to the event because Turner can’t stand for very long without feeling ill, and so they ended up near the area where the speakers walked to and from the stage. Bill Clinton spoke, and on his way back, he noticed the sign, and stopped to talk with Turner and her daughter. Soon after, a police officer found the family and invited them backstage where they met Hillary Clinton and Katy Perry. Hillary had just finished giving 11 hours of testimony about Benghazi the day before. The incident touched Turner so deeply that she sent an email to Matt Paul, Clinton’s former Iowa State Director, thanking the campaign for its kindness in the face of her struggles. From that moment on, Turner became part of the Clinton family. 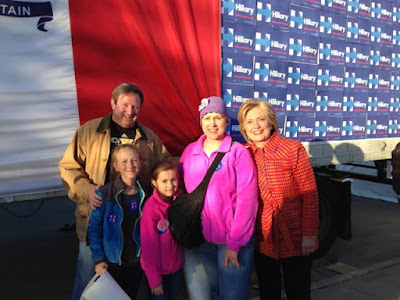 She was sent tickets to the debate, and then to the rallies before the Iowa caucus. At every single event, Hillary Clinton sent for her and her daughter, talked to them about their journey, and gave them encouragement. She introduced Turner to her good friend, and fellow cancer survivor, Betsy Ebeling, with whom Turner also keeps in touch. Every couple of months, Turner receives word from Clinton, checking in on her, making sure she is okay. Soon after, Turner’s biopsies showed that the metastasized cancer prognosis was wrong. She still has cancer in her lungs, but says her pet scans are starting to clear up. The road to recovery is long and hard. She now suffers from arthritis as well, at only 47. She can’t take long trips, stand or walk for too long, or do anything that requires much physical effort. She is struggling, but she has hope. Hope that Clinton has helped foster. Yeah, you forgot to mention that Hillary looked into Pat Smith's eyes and lied to her about her son's death. And then publicly accused Pat Smith of lying about her own lying. Accidental oversight, I'm sure.